Sophomore guard Terry Nolan Jr. celebrates a crucial basket during a game against Valparaiso in December. Men’s basketball roared past Saint Joseph’s in a second-half comeback to earn a victory in its first Atlantic 10 contest of the season Sunday. After trailing 32–25 at halftime and spending most of the first half battling a double-digit deficit, the Colonials (5-9, 1-0 A-10) dropped 45 points in the second half to pull ahead of the Hawks (7-7, 0-2 A-10) and take home a 70–56 win. GW’s comeback was rooted in aggressive attacks to the basket. The Colonials scored 34 of their points in the paint – 22 of which came in the second half – and shot 14-for-25 in the second half, good for a 56.0 percent clip. Overall, GW shot at a 40.4 percent pace. The Colonials’ defense limited the Hawks to 32.3 percent shooting on the day after a 40.0 percent effort in the first half. 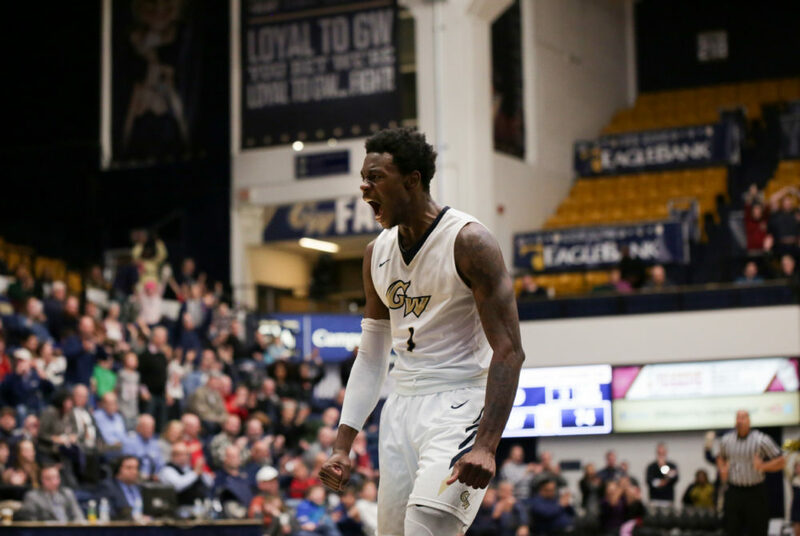 GW was also able to hold Saint Joseph’s redshirt junior guard Lamarr Kimble – who averages 16.5 points per game – to just three points. Foul shots were crucial to GW’s victory. The Colonials finished 19-for-22 from the free throw line on the game. Sophomore guard Terry Nolan Jr. led the scoring effort with 23 points and was 10-for-12 from the charity stripe. The guard completed a double-double effort with 12 rebounds on the day. “From the beginning of the year we worked on our free throws a lot, a lot in practice and it’s showing in the games,” Nolan said. A total of four Colonials picked up double-digit scoring. Sophomore guards Justin Mazzulla and Maceo Jack collected 13 and 12 points, respectively, while junior guard Justin Williams contributed 10 points to the cause. The Colonials opened the game stagnant on offense while the Hawks got off to a hot start shooting from the floor. After an early basket by Mazzulla put the Colonials on the board, the Hawks went on a 12-0 run to gain a 14–2 lead with 12:41 left in the first frame. No Colonial broke double digit scoring in the first half, but Saint Joseph’s redshirt sophomore forward Charlie Brown dominated the floor and broke into double-digit scoring in the first 20 minutes of play. Brown tallied 13 of his 20 points in the opening half. After trailing by as many as 12 points with eight minutes left in the half, late points from Mazzulla and Williams chipped Saint Joseph’s lead to single-digits and kept GW competitive as the clock wound down. The Colonials scored 12 of their 25 points in the first half in the paint behind aggressive drives to the basket, with nine of their points earned off fast breaks. GW was shooting at a 28.1 percent clip in the first half and was being outrebounded 23–19. The Hawks finished the first half shooting 40.0 percent from the field on 12-for-40 shooting. After a sluggish first half, the Colonials came alive in the second frame. The Colonials took their first lead of the game in the second half on a 11-0 run propelled by back-to-back threes from Nolan and sophomore guard Maceo Jack to put GW within three points of the lead 34–31. With less than 16 minutes to play, two made free throws by redshirt junior guard DJ Williams pushed the Colonials ahead 35–34. Joseph said his team focused on plugging the middle to force the Hawks to take perimeter shots coming out of the half, which allowed them to make defensive stops and gain the lead. Both teams traded baskets after GW’s run, and the Hawks kept nipping at the heels of the Colonials. The Colonials’ lead was whittled away due to timely three point shooting from the Hawks. While Saint Joseph’s finished 5-for-28 from beyond the arc, a key three-pointer from Kimble bought the game within three points 48–45 with less than 10 minutes left on the clock. Another shot minutes later from freshman guard Jared Bynum tied the score at 50 points apiece. Nolan broke the tie with a pair of made free throws, but the Hawks answered with a layup to knot the score again. A putback by Jack sparked a 13-0 GW run that gave the Colonials a 13-point lead with one minute of play to seal the deal. The Colonials return to action at home when they face off against Dayton Wednesday. Tipoff at the Smith Center is scheduled for 7 p.m.